The mobile chip giant just unveiled new 5G radio frequency modules that should be popular with phone makers. 5G, the next-gen mobile radio technology set to start rolling out in 2019, spells a major opportunity for Qualcomm's (QCOM - Get Report) chip business -- and not just because it could give a lift to smartphone sales. Qualcomm, whose $44 billion deal to buy NXP Semiconductors (NXPI - Get Report) is still being held up by Chinese regulators ahead of a July 25 deadline, has long been the world's biggest supplier of 3G/4G phone modems and certain complementary chips. However, it hasn't historically been a large supplier of radio frequency front-end (RFFE) components such as power amplifiers and filters, or of the modules that they're often placed inside of. And this market, whose top players include Skyworks (SWKS - Get Report) , Qorvo (QRVO - Get Report) and Broadcom (AVGO - Get Report) , has been growing steadily as 4G radios become more advanced and support more and more frequency bands. Qualcomm, aided by a filter joint venture it launched last year with Japan's TDK, has been making some RF progress. In January, the company disclosed having landed RFFE design wins with Samsung, Alphabet/Google (GOOGL - Get Report) , Sony (SNE - Get Report) , HTC and LG. And a couple weeks later, the company announced memoranda of understanding (MOU) with Chinese Android OEMs Lenovo, Xiaomi, Oppo and vivo through which the companies "express interest" in collectively buying at least $2 billion worth of Qualcomm RFFE products over three years. And the the arrival of 5G phones -- the first ones are expected next year, with shipments ramping in subsequent years -- could very well act as an inflection point for Qualcomm's RF efforts. This is partly due to the technical demands of 5G radios, which aim to deliver multi-gigabit peak download speeds and will support (in addition to traditional mobile frequency bands) high-frequency millimeter-wave (mmWave) bands that have historically been seen as unsuitable for mobile networks due to range and interference issues. However, it also has to do with the fact that Qualcomm expects 5G radios to lean heavily on a device's modem to dynamically tune how the RF front-end functions, with the help of its software as well as the network information it takes in. Qualcomm argues that this gives the company, which can offer end-to-end solutions covering everything between a phone's modem and its antennas, a competitive advantage over traditional RF players. On Monday morning, Qualcomm unveiled the QPM56xx and the QTM052, a pair of 5G antenna module offerings that have begun sampling to customers and -- along with Qualcomm's previously-announced Snapdragon X50 5G modem -- are expected to go inside phones launching in 2019. The QPM56xx supports traditional sub-6GHz frequency bands, while the QTM052, arguably the more interesting product, supports three mmWave bands north of 25GHz. 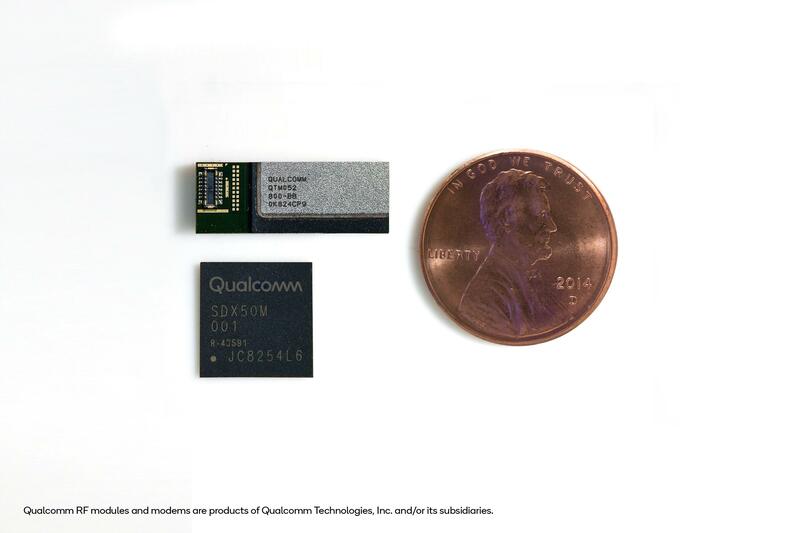 Qualcomm's QTM052 antenna module and Snapdragon X50 modem. Source: Qualcomm. As a press photo shows, the QTM052 is pretty tiny; in terms of area, it's easily smaller than a penny, even though it packs RFFE components, a transceiver, a power management IC and an antenna array. During a meeting with TheStreetat the company's San Diego headquarters, Qualcomm 5G product marketing chief Sherif Hanna indicated that three modules would typically go into phones, and be placed around its bezels. Officially, Qualcomm says up to four modules can be built into a phone. Regardless, Qualcomm seems to have a lead on modem rival Intel (INTC - Get Report) when it comes to 5G miniaturization. An Intel 5G solution for notebooks that was demoed in February required a separate kickstand to house its radio circuitry. For now, Qualcomm is declining to share which phone makers plan to use the QTM052. However, Hanna suggests the product is seeing strong design win activity among many of the OEMs that Qualcomm announced in February would be using the Snapdragon X50 within devices launching in 2019. That list includes the likes of LG, Sony, Xiaomi and ZTE. In addition, Qualcomm says that for now, it's not seeing a lot of competition in the mmWave 5G RF space. The company suggests there's more competition from traditional RF players in the sub-6GHz space, but adds its end-to-end approach also acts as a selling point here. Not surprisingly, Qualcomm expects the first 5G phones hitting the market to be high-end devices, with cheaper hardware becoming available down the line. And though new mobile radio technologies generally come with a battery life hit in their first years on the market, Qualcomm insists 5G's hit relative to 4G won't be as bad as the one that the first 4G phones delivered relative to 3G devices, and that its goal is to achieve battery life parity between 4G and 5G. 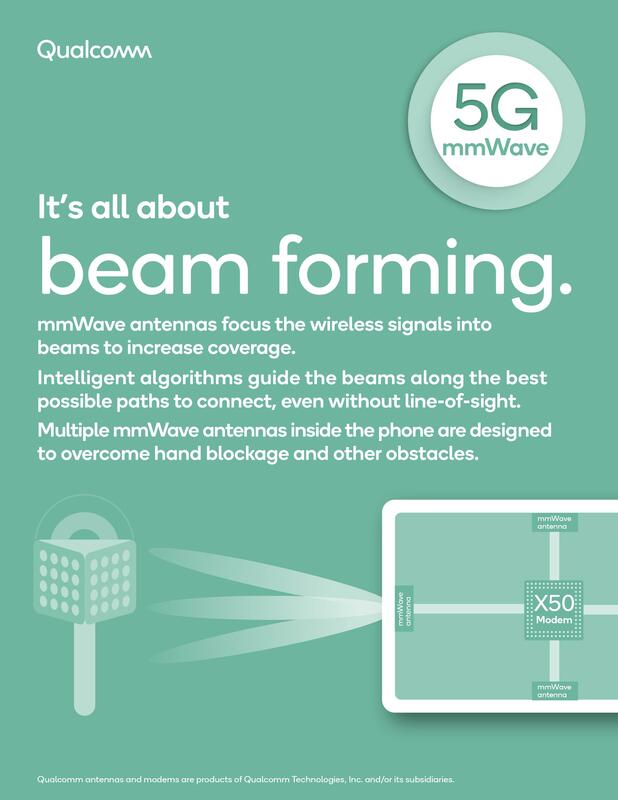 Though the signal range of mmWave radios is only in the hundreds of meters, Qualcomm is upbeat about the potential of mmWave networks to provide extensive coverage in urban areas, thanks in part to the ability of signals to bounce off building reflections. Last fall, the company published a whitepaper that (citing simulations) argued mmWave radios could provide 50%-plus coverage in many large cities simply by sharing the same cell sites as 4G base stations. Outside of urban areas, sub-6GHz bands are expected to be more widely used to deploy 5G. However, Qualcomm argues there's still some room to use mmWave radios in suburban areas, where Verizon (VZ - Get Report) and others have shown an interest in using 5G to offer fixed broadband services. The 5G RF market won't be a winner-takes-all game. And with 5G set to provide a fresh boost to the dollar value of the RF content going inside the average phone, both Qualcomm and RFFE incumbents such as Skyworks and Broadcom should benefit. However, Qualcomm's ability to offer modem-to-antenna 5G solutions does give it a unique sales pitch, and appears to position the company well to take some share. Like its growing automotive and IoT chip businesses, Qualcomm's RF growth should help it offset some of the pressures its very profitable patent-licensing business is facing.